Taking Robert Plutchik‘s Emotion Wheel as the root of this approach – it is possible to combine 4 primary emotions in energetic and non-energetic states to create the entire range of human emotions. This theory states that there are 8 extremes of 4 opposite emotions and a high and low energy state for each of the 8. With a neutral energetic state we have: joy, trust, fear, surprise, sadness, disgust, anger, and anticipation. With an intense energetic state we have: ecstacy, admiration, terror, amazement, grief, loathing, rage, and vigilance. With a mild energetic state we have: serenity, acceptance, apprehension, distraction, pensiveness, boredom, annoyance, and interest. Each of the four states has an opposite, and so: joy has sadness, trust has disgust, fear has anger, and surprise has anticipation. 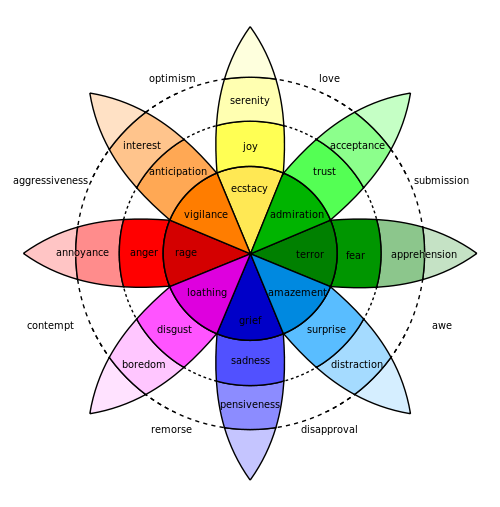 In order to replicate this spectrum of emotions we need 4 variables – each opposite state reflects the emotion, and alongside this we also need to how much energy to give it. The four variables will be: joy-sadness, trust-disgust, fear-anger, surprise-anticipation and the amount of energy they are capable of is determined by the personality.